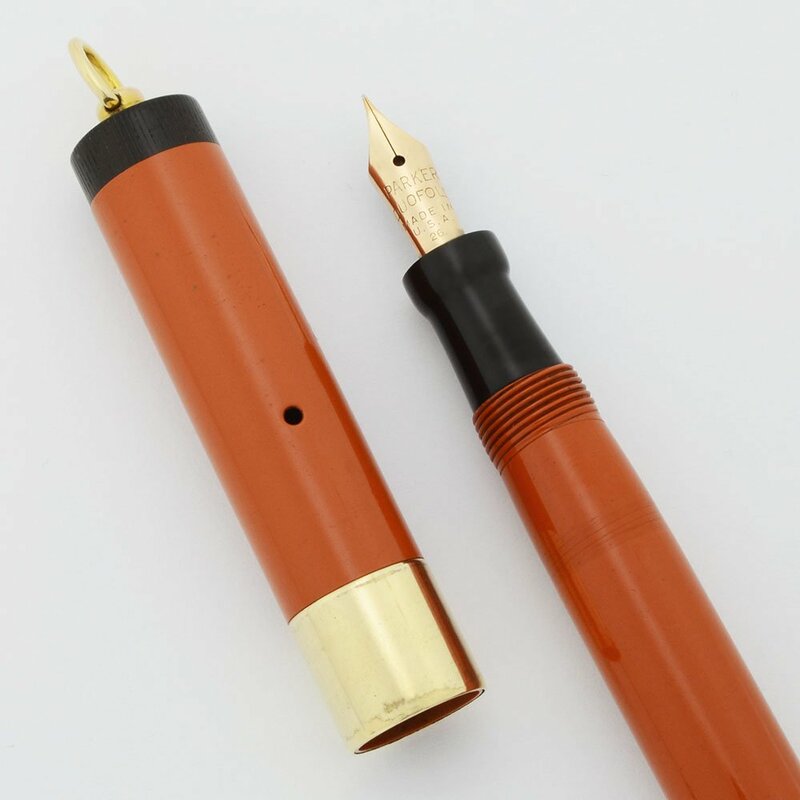 Parker Lady Duofold Deluxe Lucky Curve ring-top fountain pen from the 1920s. Button filler in the classic "red" (looks orange) hard rubber with black ends and a wide gold plated or filled cap band. Gold Parker Duofold Pen nib. Very nice condition with, fully restored and working well. Color "Red" (orange) cap and barrel with black ends and a 1/2-inch wide cap band. Gold plated ring-top hardware. Nib Parker Duofold Pen nib marked 26. It's very smooth with excellent tipping material, and just a touch of flexibility to it. Condition Very nice condition. The pen looks shiny and the coloration is excellent. It is a small, dainty pen -- a good size for stowing in a purse. There is moderate to heavy scratching toward the end of the barrel caused by posting. Some scratches are deep. The cap has light to moderate scratching. The imprint is clear, but scratch marks begin where it ends on the barrel. The end pieces, trim ring, and ring top look great.